Vintage '58 Stratocaster with EJ mojo. Vintage Strat merchant extraordinaire Ed Matthews, the Ed behind "Eddie Vegas", is currently listing a 1958 burst once belonging to Eric Johnson. Below is an excerpt from the www.eddievegas.com page featuring this holiest of holy grail specimen. 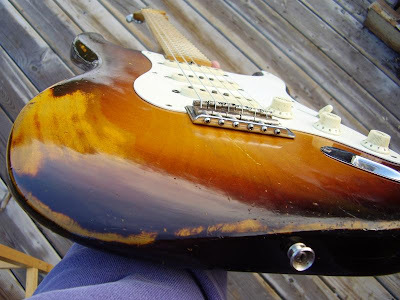 "...1958 Fender strat serial # 028024 guitar from Guitarzan in early to mid 90's Texas, owner Tim Gnader, he said it was owned by Eric Johnson. It was a blonde finish with a broken neck. Sent the guitar to Tom Murphy to refinish in an accurate 3 tone sunburst and looked for an original neck to replace the broken neck, couldn't find one. He found a Elliot Mechanic neck made in Canada which is a repro strat neck, but was the perfect fit. Tom finished the guitar in an incredible 3-tone finish(pictures I sent to show you the guitar) that george gruhn and everyone that has seen it believes that it is not a re-fin, it is a complete re-fin by tom murphy, not original other than the parts, body and hardware, neck is not origianl to the guitar. All the original hardware, bridge, pickups everything was sent to Dan Erlewine after finishing to be re-assembled, took over a year to get it back. There were a few screws from the 60's before sending which I purchased the correct 1958 ones again before sending so all original screws would match. All of those items were purchased from Uncle Lou Gatanas located in Flushing NY. 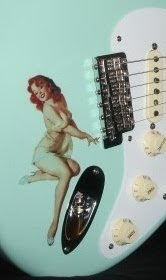 Also BB King played this guitar and said that he actually loved it, signed it as well on the back of the headstock in blue sharpie..."
Also visit Guitarville By Vegas eBay listings where current listings include a 1964 Daphne Blue Strat, once owned by Smokin' Joe Kubek.